Sundling Park is a long narrow access to the Lake Michigan beach. About 400 feet on the level, and then a moderately steep descent to the beach through loose sand. The park has been planted with shade trees and has large rocks scattered around on which you can sit. 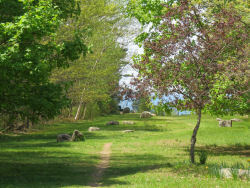 Picnicking- Although there are no actual picnic tables, some of the large rocks would work for a small picnic, and the shaded lawn would be a pleasant place to spread a blanket. Handicap Accessibility- The surface is natural, but it would be possible for someone in a wheelchair to get from the parking to the grassy area. Access- Parking for about 12 cars just off Red Apple Road. Restrictions- Dogs must be leashed, no motor vehicles. No lifeguard. Turn west on Red Apple Road from US 31 on the south edge of Manistee. In 3.2 miles the park will be on your right.